Leland-based Manufacturing Methods has entered into a partnership with an Australian company that has recently located its U.S. headquarters in Wilmington. Tru Blue K9000 has chosen Manufacturing Methods to produce and assemble all its U.S.-based, do-it-yourself dog wash machines, said Tim Darmanin, founder and managing director of Tru Blu K9000 Dog Wash LLC. Tru Blue K9000 established its U.S. headquarters, an office and showroom, at 4305 Oleander Drive in late June. Since setting up base in Wilmington, the company has had about 25 units installed in the American market with its manufacturing in Australia, he said. Now, the company aims to both sell and manufacture out of Southeastern North Carolina. Since 2005, Tru Blu K9000 has sold over 1,600 machines worldwide. There are about 300 units in the United States from a push into the market back in 2010, Darmanin said. The relationship with Manufacturing Methods began in August, and will facilitate an even greater push into the American market, he said. Manufacturing Methods has become the second global manufacturing base for the dog wash machine, the first being out of Australia. The company also has distributors all over the world, including the United Kingdom and Canada. Through the new agreement with Manufacturing Methods, there are currently about 30 units set to be produced, with 50 to 75 total units expected by the first quarter of 2019, he said. “The way I look at it is … this is now. This is the way you wash your dog today. And that’s what we’re going to try to create here. It’s what we have been able to achieve back at home [in Australia] and I’m pretty confident we can do it here,” Darmanin said. Both Darmanin and Pete Peterson, found­er and CEO of Manufacturing Methods, said the partnership was the right fit for their companies, with opportunities for future growth. It was also built on the ability of Manufacturing Methods to meet the specifications and quality of the product, Darmanin said. “There was never really the plan to manufacture here in Wilmington. We had our eyes out all across the country really, the Midwest, somewhere where there’s more of a logistical benefit from that point of view. But once I met Pete … there was a lot of synergy between Pete and I. And the journeys we have been on in our businesses. “We had to be confident and comfortable with who we are dealing with … It’s more of a partnership than just someone that’s providing a service for us,” Darmanin said. Last year, Manufacturing Methods invested more than $1 million in equipment, including a large laser automation machine, at the Leland-based facility. “It’s definitely what we put the equipment in for is opportunities like this,” Peterson said. The new equipment allows for greater ease, efficiency and accuracy in its production, Peterson said, adding that it’s an ideal range of equipment for the new partnership. “We don’t have one of those machines in our backyard,” said Darmanin of Manufacturing Method’s laser cutting and automation. In addition, Darmanin said that the Manufacturing Methods’ ability to take concept to design quickly is another advantage to scaling the operation here.”There’s some of these future models that I’ve had my head, and methods and ways of building the machines. It kind of opens up a new world for me because the capabilities of this place and the equipment and tools even from the design … which is quite unique,” he said. Peterson said Manufacturing Methods is committed to providing the resources for whatever production Tru Blue K9000 might need in the future, Peterson said. And that could mean expanding space at its 15-acre property and hiring more employees to meet the needs of Tru Blue K9000 sometime in the future. Manufacturing Methods, through its commitment to the company, has already provided space and workforce for producing the dog wash machines. Several of its current employees have been moved permanently to fulfill the needs of the project. Peterson said an additional three to five employees are needed to fill positions left open from moving around its current workforce to focus on Tru Blu K9000’s production. Although the partnership isn’t changing the core of Manufacturing Methods’ business, it is another revenue stream that Peterson said the company could concentrate on that is more scalable than some of the contract manufacturing and job-shop work currently taking place at the facility. “We are trying to lean more toward the repetitive, consistent revenue streams then the spikes and drops with what we do,” Peterson said. “To be honest, something like this would maybe phase out some of the job shop work. It’s easier to perfect something like this and with consistent employees and skill level. It’s more efficient, more streamlined … I could see a business transition over the next three to five years to things more like this,” Peterson said. Darmanin said operations are also having an impact on local service industries, including those needed for plumbing, signage and fencing. The business is also shared through all the vendors utilized by Manufacturing Methods, Peterson said. 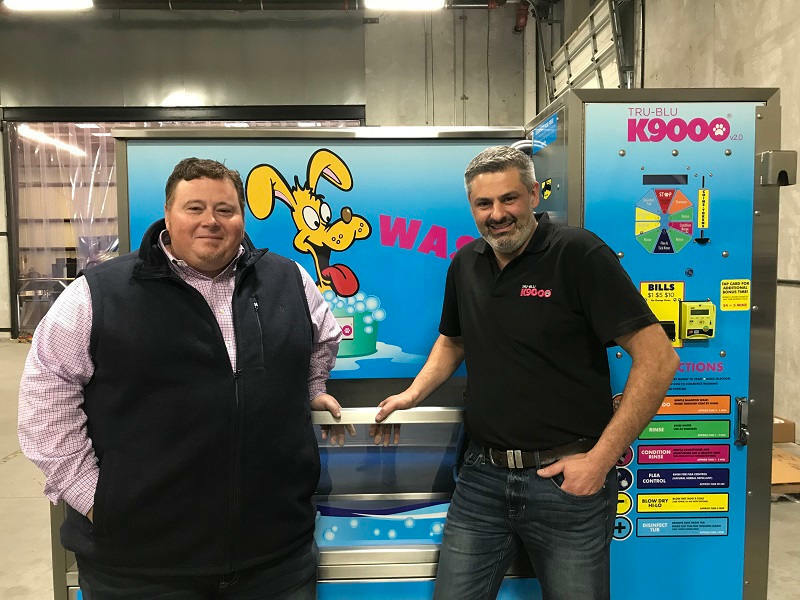 Pete Peterson (left), founder and CEO of Manufacturing Methods, and Tim Darmanin, founder and managing director of Tru Blu K9000, have formed a partnership to manufacture K9000 dog wash machines in Leland. Tru Blu K9000 is marketing DIY dog-washing stations out of Wilmington. WILMINGTON — It may be one of the most unique businesses to ever open a Wilmington headquarters: a company that builds state-of-the-art machines for washing dogs. Australia-based Tru Blu K9000 has opened its U.S. headquarters at 4305 Oleander Drive. The 13-year-old company is known worldwide for producing self-contained, do-it-yourself dog washing stations, 1,600 of which can be found throughout Australia and Europe. Now, the company is reaching out to U.S. buyers from its Wilmington office. Paul Baron, the company’s North America CEO, connected with the company a few years ago while researching pet products. A Wilmington resident and dog-lover, Baron mentors business students at the University of North Carolina Wilmington’s Center for Innovation and Entrepreneurship. When friend and Tru Blu K9000 founder Tim Darmanin asked Baron to head up the company’s U.S. expansion, Baron insisted on the Port City. The new Wilmington headquarters in not just a place to wash your dog, it’s where businesses of all kinds can buy a K9000 of their own. Baron said the company markets the machines to veterinarian officers, apartment complexes, pet-friendly hotels, parks and campgrounds and any other businesses that see four-legged customers. Businesses that buy the machines can set their own price for washes, but K9000′s standard is $10 for 10 minutes. Baron said if placed outside, the machines can give companies a revenue stream outside of normal business hours. “At two dog washes a day, they are profitable for the person who buys them,” Baron said. Baron demonstrated the technology — a glass-fronted, open-top container — with his Portuguese Water Dog puppy, Larry. Baron opened the front of the K900 and let Larry jump inside; a leash can be clipped to the container for restless dogs. After scanning a credit card, Baron selected his wash cycles: shampoo, rinse, condition, flea control and blow-dry. Larry, excitable and loud outside of the washer, calmed down when the soapy water hit him. Darmanin said in his native Australia, the K9000s have become so popular that it’s unusual for a new pet store or car wash to open without one. With orders coming in from places like Florida, Georgia and Alabama, he’s hopeful American customers get used to seeing the machines. “It’s completely in line with the trends of business and the trends of people — we want to get more things done in one location,” Darmanin said. The Tru Blu K9000 dog washing station costs $10 for a ten-minute bath for your pup.